Most likely the immune system was put into place in the original human body design. We know from Exodus 20:11 and other verses that God completed His work of creation in six days. Therefore, the human body and its functional parts, including the components of the immune system, must have been part of the original creation. God said that all He had made was very good (Genesis 1:31). Since there were no pathogens (germs), parasites, or diseases prior the Edenic Fall and subsequent Curse, the immune system may have functioned differently in that world unmarred by sin and death. The immune system serves more than just to “defend” against disease. The immune system was designed to interact with microbes and cleanse the body of aged, dying, dead red blood cells and bacteria even in the Pre-Fall World. There are toll-like receptors in the immune system that have “sensory” function, as well as defense functions in animals and humans. The immune system in Peyer’s Patches in the GI tract assists the normal development of the intestine and regulates the normal microbiome. Consider a sheep dog designed to positively interact with sheep (herd them); they only “defend” with teeth when a predator (e.g. a wolf) approaches. The immune system in a pre-Fall world (Gillen and Sherwin 2013) worked to positively assist body development (as will be discussed); in the post-Fall world, they also defend against pathogens. This is how most creation biologists view the immune system. Immunology is that branch of biology that involves studying how the body is designed to protect itself from agents of disease called pathogens. The word immune comes from the Latin root word that means “freedom or protection from taxes or burdens.” This amazing system battles disease in a manner that is so complex and intricate that the most gifted imagination could not envision such incredible functions. In today’s world (post-Fall), the primary role of our immune system is to recognize pathogens and parasites, then to destroy them. Three main methods of destruction include baths of caustic digestive enzymes that cause rapid perforation with submicroscopic holes, overwhelming organisms with sticky proteins, and lastly by ingestion by macrophages (amoeba-like cells). In addition, the immune system is designed to prevent the proliferation of mutant cells, such as various cancers. When this system malfunctions or when a boundary is breached, it can result in localized or systemic infections, or worse, death. The immune system1 acts like a protective physical and biochemical bubble around the human body, protecting against everyday germs (Fig. 1). It provides an invisible barrier to nonspecific and specific pathogens. Diseases such as malaria, MRSA, West Nile Virus, invasive “flesh-eating” bacteria, HIV, bird flu, and pathogenic E. coli all threaten people in today's cursed world ( Genesis 3 ). 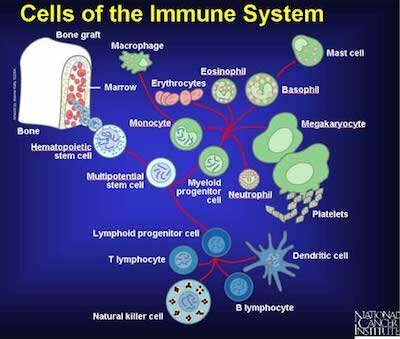 The immune system has been designed as the body's major defense not only against bacteria and viruses, but also fungi, parasites, and toxins. It serves as an invisible boundary of mucous membranes, strong chemicals, and proteins that defend us against new and old diseases. We might also think of it as an umbrella over us, protecting against the constant “rain” of bacteria, fungi, parasites, and toxins. Stages of the immune system include the skin and mucous membranes, the first line of defense; white blood cells as second line of defense (Fig. 2); and antibodies as third level of defense. 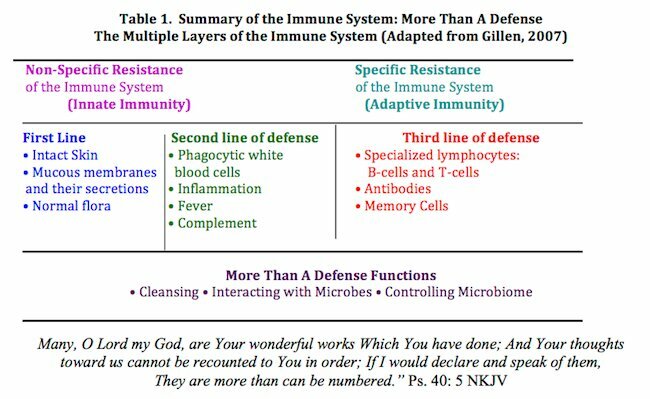 The immune system includes the lymph glands, lymph nodes, spleen, bone marrow, tonsils, and appendix.1 According to Genesis 1 all creation was declared good or very good. It is clear that there were no pathogens and parasites before the Edenic Curse in Genesis 3. So, did the Creator create the immune system after the Fall of man when the Curse was implemented (Genesis 3)? An immune system was likely included in man's original design. Although no one knows for sure, it seems the immune system would be useful to the body even in a perfect world, because without an immune system and its components such as macrophages, the body would not be able to cleanse itself of worn-out blood cells (about 200 billion per day) and other debris created by apoptosis (Tortora, Funke, and Case 2013, pp. 494–495) . Did God create the immune system knowing that we would need it to battle pathogens after the Fall? Was it inevitable that we would encounter germs? These are questions that creation scientists have pondered. Creation immunologist Dr. Joseph Francis suggests that rather than viewing the immune system we know today—as a defense system against microbes—think of it rather as a sensory system designed to interact with beneficial microbes. Granted, our immune system is currently dealing with the corrupted and cursed world around us, and parts of the immune system, like other body systems, are no longer perfect. However, we do see what we believe are remnants of the original very good design. For example, creation scientists hypothesize that our immune system was originally designed to interact with microbes, such as beneficial bacteria and other microbes. OVER 95% OF ALL BACTERIA ARE NOT CLASSIFIED AS CAUSING DISEASES. In order to appreciate this refreshing non-Darwinian perspective, we should understand that most bacteria arebeneficial to the environment and us. The news media glorifies devastating pathogen-induced diseases even though over 95% of all bacteria are not classified as causing diseases. Likewise, a vast majority of protozoans are mostly free-living or mutualistic. Without large mutualistic populations of beneficial bacteria in our intestines, we would be unable to digest materials and absorb compounds properly. Occasionally, we read or hear about E. coli outbreaks that have caused serious illness, and yet of the ~170 strains that exist, less than a dozen are actually classified as pathogenic. The other 150+ strains are beneficial. In fact, most of them are doing a valuable work, as in vitamin B synthesis. The B-complex of niacin, riboflavin, and vitamin K all come from the E. coli population in our gut. In addition, intestinal bacteria help us break down macronutrients and aid in their assimilation into the body.Research indicates that beneficial bacteria (normal microbiota2) that we receive at birth may even help in the normal development of our gut. Studies using germ-free animals have shown that if they are raised without bacteria and other microorganisms including protozoa normally found in the intestines, the creatures do not develop normally. In one study, researchers eliminated bacteria from mouse intestines at a very young age. Their intestines did not develop properly and these “germ-free” mice experienced atypical growth. Additionally, the circulatory system did not perfuse the intestines properly. This strongly suggests that bacteria may guide development of the GI tract of animals and people. The normal microbiota2 has a symbiotic relationship with the individual. Perhaps the immune system operates in our intestinal ecosystem by protecting some of the bacteria in a symbiotic fashion. The immune system may very well aid in keeping out the deleterious microorganisms that constantly compete with these beneficial bacteria. This is termed microbial antagonism: active opposition between two microbe populations. A related field of study in microbiology is known as probiotics (the administration of live microorganisms in adequate amounts) and may very well boost immune function, inhibit the growth of pathogens, and increase resistance to infection. Probiotics mainly concern repopulating the large intestine with Lactobacillus and other beneficial species of bacteria. The surface of human skin, which is mostly dry, is populated with salt-tolerant bacteria inhabiting a specific ecological niche. What would happen if these normal bacterial populations ofStaphylococcus on the skin were eliminated through, for example, a high antibiotic regimen? As any dermatologist knows, fungal spores resulting in a stubborn infection would quickly occupy the vacated niche. There are several other examples of the important, beneficial work of bacteria and protozoa. Creation biologist Dr. Joseph Francis describes bacteria and viruses as the “organosubstrate of life” orbiomatrix. From this perspective, bacteria and viruses are seen not so much as distinct organisms but as “extra-organismal organs,” that is, the means by which “higher” organisms meet their needs. Indeed, the entire ecosystem is supported by this elaborate maintenance-and-repair substrate. In the biomatrix model, Francis views the minority of disease-causing bacteria and viruses as having come about (1) from displacement from their original created location and (2) from modification of their biology which may include mutation. The original symbiotic function of these organisms was corrupted after the Fall, and they are now pathogens. It certainly appears from research that perhaps the immune system was originally designed to control homeostasis in the gut and perhaps elsewhere in the body. About 10 years ago, research by Rakoff-Nahoum et. al. (2004), reported that Toll-like receptors (TLRs are proteins on the surface of sentinel cells that help the body recognize microbes) play a crucial role in host defense against microbial infection. The microbial ligands recognized by TLRs are not unique to pathogens; however, both pathogenic and good bacteria stimulate TLRs. They demonstrate that good, commensal bacteria are recognized by TLRs under normal steady-state conditions, and this interaction plays a crucial role in the maintenance of intestinal epithelial homeostasis. Furthermore, we find that activation of TLRs by commensal microflora is critical for the protection against gut injury and associated mortality. These findings reveal a novel function of TLRs—control of intestinal epithelial homeostasis and protection from injury—and provide a new perspective on the origin of host-microbial interactions. The pre-Fall immune system may have once served to sense our environment and positively direct and interact with very good (mutualistic and commensal) microbes that were originally provided to benefit us, perhaps as nutrients and to control overgrowth of unneeded bacteria and fungi. In addition, the immune system may have regulated how the very good normal microbiome functioned, until “contagion” entered the world after Creation’s Fall and subsequent Curse. Sheep dogs (Fig. 3) are designed to positively interact with sheep (herd them). Sheepdogs, like shelties and collies, were designed by man to herd, direct, and keep the sheep “in-line.” They use their eyes, bark, corralling instinct, etc. to make sure the sheep are safe. They only defend with teeth when a threat like a wolf, coyote, or thief approaches. In like manner, the immune system in a pre-Fall world worked to positively assist body development, “herding” the normal microbiome; in the current post-Fall world, they also defend against threats, i.e., pathogens. One of the early observations regarding the immune system was the ability of the immune system to recognize “self” from “non-self.” Special white blood cells called phagocytes are designed to engulf and digest invaders by phagocytosis (Figs. 4 and 6). In animals with either open or closed circulatory systems, phagocytes monitor tissues as they travel throughout the body. The discovery of the protective role of phagocytes was first seen in echinoderms and was a milestone in immunology. 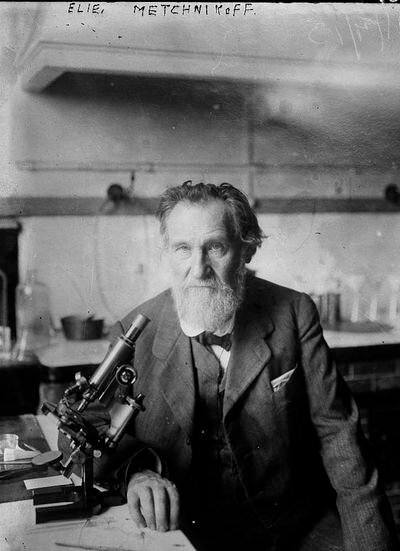 In 1882, Russian biologist Elie Metchnikoff3 collected transparent starfish larvae on a beach in Europe, pierced them with rose thorns, and waited to see what happened (Figs. 5 and 6). A day later, he saw that phagocytes had collected at the site of injury. The thorn in a starfish larva is not unlike a splinter having pierced the skin of a person in terms of the immune system rapidly responding to an antigen. Phagocytosis is the process in which cells engulf particles in a manner similar to the way an amoeba eats (Fig. 4). The human body uses it to both cleanse itself of aged and dying cells, as well as in defense against a microbe, parasite, or toxin. Phagocytosis (Phago: eat; Cyte: cell; Osis meaning process) is a process of engulfing a solid particle by a phagocyte or amoeba to form an internal phagosome (Ancient Greek, φαγεῖν (phagein meaning “to devour,” κύτος, (kytos), meaning “cell,” and -osis, meaning “process”) (Wikipedia 2013). The cell or particle becomes surrounded by cytoplasmic extensions called pseudopods that ultimately fuse. Thus, the particle becomes surrounded by a membrane derived from the plasma membrane and contained within an organelle analogous to a food vacuole in an amoeba. This vacuole then fuses with lysosomes (organelles that contain digestive enzymes), so that the ingested particle and the digestive enzymes still are separated from the cytoplasm by a continuous membrane. The four basic phases of phagocytosis are (1) Chemotaxis, (2) adherence, (3) ingestion, and (4) digestion (Fig. 4). In reality, phagocytosis is much more complex than this and one of the processes that Mike Behe might call irreducibly complex (Behe 1996, pp. 102–103). The body cells that participate in phagocytosis are of two principal kinds: neutrophils of the blood (Dr. Metchnikoff3 called them “microphages”) and the macrophages of the tissues. Phagocytic action is often readily apparent on microscopic examination of inflamed tissue. The phagocytes are attracted to invading microbial cells or other foreign particles by a process called chemotaxis. Chemotaxis is the movement of phagocytes in response to the presence of a chemical, often produced by a pathogen or parasite product. Once in contact with microorganisms, the leukocytes engulf many of them just as an amoeba surrounds and digests a particle of food. When pus is examined under the microscope, many of the organisms are seen to be within the cytoplasm of the white blood cells. Some bacteria may be engulfed only to escape again, perhaps with destruction of the phagocyte. Other organisms, such asMycobacterium leprae, may survive and even multiply inside phagocytes and be carried by them to lodge in peripheral nerve myelin sheath, and then grow in the cooler parts of the body (nose, fingers, toes). The defensive action of lymphocytes is reinforced by macrophages. Macrophages have a nonspecific role in that they engulf not only bacteria and other foreign particles, but leukocytes as well. These phagocytic cells are the scavengers that clear away the remains of bacteria, leukocytes, and polysaccharide antigens when the infection is conquered. Macrophages are phagocytic cells usually found in a resting state. Their phagocytic capabilities are greatly increased when stimulated to become activated macrophages. This stimulation is primarily by ingestion of antigenic material. However, cytokines from antigenically activated helper T-cells may also activate macrophages. Activated macrophages are more effective, their appearance becoming recognizably different as well; they are larger and become ruffled. Activated macrophages are especially valued for their enhanced ability to eliminate pathogenic intracellular bacteria like Mycobacterium tuberculosis. Leukocytes4 (white blood cells, or WBCs) are nucleated cells and do not contain hemoglobin. WBCs are not nearly as common as red blood cells (RBCs). Another interesting difference between them is found by comparing their movement. RBCs cannot move on their own; they are simply carried along by the flow of blood. Most WBCs, however, can move on their own. Once in tissue spaces, leukocytes are attracted to dead cells or foreign materials by chemotaxis. For example, when a bacterium or virus gets into tissues, WBCs move out of the bloodstream via diapedesis, the passage of leukocytes through the blood-vessel pores and into the tissues spaces. They are attracted by chemotaxis right to the point of infection. In this way, the WBCs can get right to the attack. In fact, they exhibit amoeboid movement, extending their pseudopods and flowing into the infected tissue. There are actually five different kinds of leukocytes, all with specific tasks. The five kinds are grouped into two principal categories: granulocytes (neutrophils, eosinophils, basophils) and agranulocytes (lymphocytes and monocytes). By nature, WBCs are transparent, and they must be stained for microscopic observation.Lymphocytes are slightly larger than erythrocytes and are the second most common type of WBC. They have a small, dark nucleus with a small rim of cytoplasm. With a microscope, you often see only the nucleus or its surrounding thin, white ring. The first granulocyte, the neutrophil, is the most common WBC. The neutrophil is distinguished by the fact that its nucleus has several lobes. In addition to the multi-lobed nucleus, the granules in a neutrophil are rather small and not very dense. These cells fight infections by phagocytosis, engulfing bacteria, other microbes, abnormal cells, and foreign matter infecting tissue. It has been estimated that they can devour about 10 bacteria before dying. Monocytes follow neutrophils during an infection. They are the largest WBCs, and only become common after an infection. They have a kidney-bean–shaped nucleus and more cytoplasm than lymphocytes. These cells destroy invading organisms and foreign material by phagocytosis. Unlike neutrophils, however, these cells are “tough”: it is estimated they can consume about 100 bacteria during their lifetime. Monocytes become macrophages as they mature and typically migrate out of the bloodstream and take up residence in the tissues. When residing in tissues, they are called “fixed” macrophages, meaning “big eaters.” In our lungs, deep in the simple squamous epithelium, are very delicate “dust cells.” These cells are wandering macrophages living in the tissue and swallowing up the dust that gets into our lungs. Basophils are the rarest (less than 1 %) of white blood cells. They have a bi-lobed nucleus, and blue stained granules. Their granules contain histamine, heparin, and other chemicals. Histamine promotes inflammation, in particular vasodilation, and stimulates the immune response. Heparin allows controlled local blood infusion, enabling recruitment of additional white blood cells to the area. In addition to their role in the inflammatory response, basophils play a key role in external parasitic infections (like ticks and mosquitoes) and in allergic responses involving IgE. Basophils have a short life span, usually a few hours or days. Eosinophils are uncommon phagocytic cells, but are needed to combat parasites, especially worms. They have two-lobed nuclei, and their granules stain red with Wright’s stain, thus their name (“eosin” means “red”). They decrease inflammation. They also increase in number during parasitic infections. Eosinophils secrete enzymes that kill or control parasites, like malarial protozoans, tapeworms, roundworms and flukes. 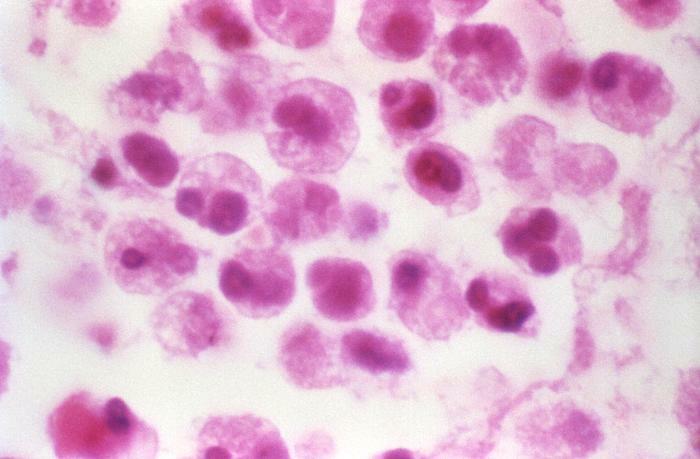 Eosinophils also have some effect on Plasmodium falciparum, the cause of malignant malaria. However, their action is less effective than their ability to phagocytize worms. It often takes dozens of them to attack, phagocytize, and kill parasites (Roberts, Janovy, and Nadler 2013). 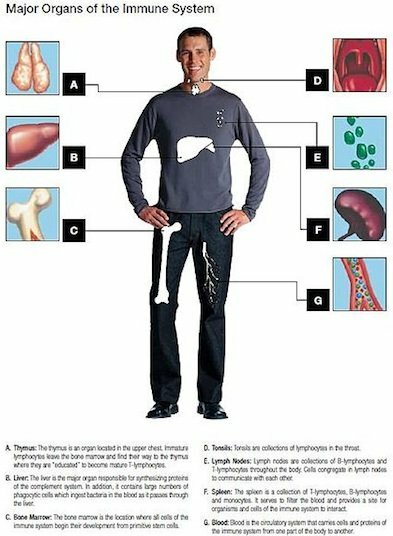 The spleen is classified as an organ of the immune system and closely associated with the circulatory and the lymphatic systems (Fig. 6). It is an abdominal organ that lies between the bottom of the stomach and the diaphragm. In the cross-section of the spleen various coats and layers of splenetic tissue may be seen. The spleen is covered by an external, serous coat that lubricates the outside of the spleen with serous fluid to protect it against friction against the other viscera. Immediately within the serous coat is the internal, fibrous coat of the spleen. It forms the framework of the organ and follows the vessels within the spleen, forming sheaths around them. From these sheaths extend the fibrous bands that bind the sections of the spleen together, much as the fibers of a sponge. The sacs enclosed are called areolae, and within the areolae is the pulpy tissue of the spleen. This pulpy tissue is a reddish-brown and is where the blood is filtered to remove bad cells, convert their hemoglobin to bilirubin, and return the iron from the destroyed cells back to the blood. The spleen is an example of the body’s interwoven complexity, knit by the Master Craftsman. Its design points to an Awesome Creator. The spleen, from the beginning was used to cleanse the blood of aged cells. It also plays a role as a blood reservoir, in the creation of blood cells, maintenance of blood volume, production of some types of blood cells, and recovery of material from worn-out red blood cells. Its function in a post-Fall world involves the removal of metabolic waste, erythrocytes, and bacteria from the blood. Figure 7. Spleen filters Red Blood Cells. The spleen is responsible for filtering and regulating cells in the body. Alan L. Gillen image. The lymphatic system consists of the major underlying anatomical structures that facilitate the immune response (Fig. 8). The lymphatic organs are impressive in structure and distinct in function. 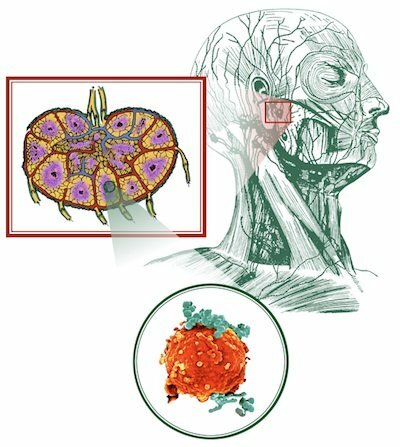 The anatomy of the diverse lymph nodes are marvelously interwoven and provide further evidence of an intelligent design by the Skilled Craftsman. Each lymph node contains leukocytes that win victories over highly specific pathogens and toxins. The lymphatic system was once thought to be part of the circulatory system since it consists of lymph, a moving fluid that comes from the blood and returns to the blood by way of capillaries. Not only does lymph play a critical role in the immune system, but it also is designed to absorb fats (cholesterol and long-chain fatty acids) from the lacteals of villi of the small intestine and aid in homeostasis. The lymphatic vessels are present wherever there are blood vessels. They transport excess fluid to the terminal vessels. Terminal vessels feed into the thoracic duct that returns lymph to the heart prior to blood reoxygenation. Lymph helps with the distribution of fluids and nutrients in the body, because it drains excess fluids and protein so that tissues do not swell up. Limf (lymph) means “clear spring water” in Latin, and the lymph keeps other body fluids pure and in balance with the rest of our body cells. Fatty content is transported via lymph to the venous circulation and eventually distributed or metabolized elsewhere in the body. If the skin, blood, and lymph do not stay clear, then infectious diseases can arise. The most famous one in the Bible is leprosy (Gillen 2007). Lymph nodes with their capillaries are the most obvious interlacing fabric in the body’s primary defense base. The nodes are small oval structures (Fig. 8) that interweave with lymph capillaries, blood capillaries, reticular connective fibers, and tissues. 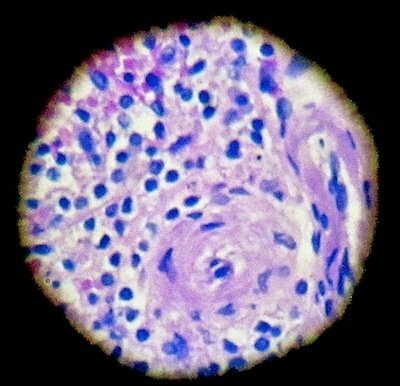 A capsule of dense connective tissue covers each lymph node and is called a trabercula. These extensions divide the node into compartments, provide support, and interlace with blood vessels into the node interior. The superficial region of a lymph node, the cortex, contains many follicles. The deeper region of a lymph node is the medulla. Lymph nodes are a “military base” that deploy soldier cells, B- and T-lymphocytes to a location where “cell wars” occur. Once a microbe or parasite invades the body, T-cells and B-cells quickly go into “battle” from the interwoven, reticular fibers and travel with the flow of lymph to the “war” zone. Other leukocytes sense foreign material and assist in filtering and cleansing the lymph to keep it pure. There are more than 100 tiny lymph nodes, the size of kidney beans and generally located in clusters near veins at strategic points along medium-sized lymph vessels at the knee, elbow, armpit, groin, neck, abdomen and chest. Blood5 is cleaned and filtered in the lymph nodes, and germ-fighting cells gather there during illness. This carefully designed filtration process prevents bacteria, cancer cells, and other infectious agents from entering the blood and circulating through the system. Macrophages perform phagocytosis by “lassoing” the bacteria. The “prisoner” bacteria are showered with hydrogen peroxide or other deadly toxins. Digestive enzymes (lysozymes) are then sent into this “death chamber” to dissolve the bacteria. During any kind of infection, the nodes enlarge in their area of drainage due to the multiplication of lymphocytes in the node. One very common bacteria pathogen is Staphylococcus aureus, which has a methicillin-resistant strain called MRSA. It is frequently involved with a scratched skin or wound. 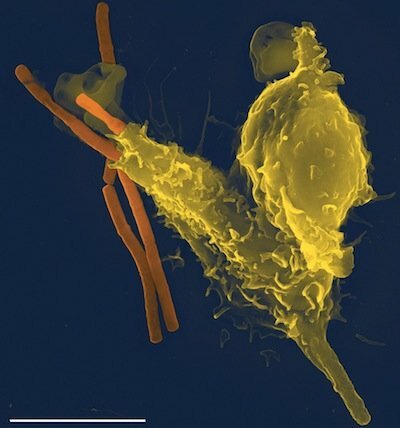 The macrophage pulls the Staphylococcus aureus inward to deliver phagocytosis. Macrophages locate bacteria like Staphylococcus aureus more easily in a wound’s blood and cell fragments with opsonins, complement, antibodies (like IgG and IgM), and other chemicals. Antibodies and complement factors play a role in staph bacteria capture. Opsonins (serum proteins) position themselves on bacteria, serving as appetizers for neutrophils and macrophages to consume. The word opsonin is from the Greek word opsonin, meaning to prepare for eating. Opsonins can be any molecule that enhances phagocytosis by marking an antigen for an immune response and are one of the most important ingredients for successful phagocytosis of S. aureus. The complement system helps to “complement” or assist in the ability of antibodies and phagocytic cells to clear staph from human cells. Sometimes, S. aureus resists phagocytosis due to its leukocidin, an exotoxin that can kill neutrophils, macrophages, and other leukocytes. If the bacteria count is very high, it will take measures beyond the human immune system (such as antibiotics) to kill this potentially virulent pathogen. It was the work of Dr. Paul Brand (the late world-renowned missionary, orthopedic surgeon and leprosy physician) that illustrated, in part, the value of studying cells under the microscope to advance treatments for patients with Hansen’s disease. Paul Brand (Brand and Yancey 1980, 1984) studied leukocytes and phagocytosis in albino bats at the National Hansen Center (a leprosy research clinic) in Carville, Louisiana. His focus was trying to understand the pathological mechanisms of Hansen’s Disease. Brand began his leprosy research studying leukocytes using albino bats but found this was not very successful in studying phagocytosis. He would later use the armadillo as a better animal model for research of leprosy. Brand describes his study through a microscope when studying the power of the blood (leukocytes) in cleansing the body of leprosy. He studied the blood in albino bats and was able to see through its skin into a new universe. He would use this information later to study, understand, diagnose, and treat people with Hansen’s disease, or modern day leprosy. He also helped us understand the distinction between biblical leprosy7 and Hansen’s disease (Gillen 2007). Leukocytes are the armed forces of the body that guard against invaders like Mycobacterium leprae (the leprosy bacillus). In Brand’s study of bacterial phagocytosis in bats, he observed these cells creeping along the walls of veins, but also free-floating in the bloodstream, elongating and changing shape in order to navigate through small capillaries. Leukocytes first patrol and then locate the dangerous leprosy bacillus. Clotting agents then stop the bleeding. Before long, scavenger cells appear and begin to clean up the debris. Fibroblasts, the body’s reweaving cells, gather around the injury almost as if they have a sense of smell and abruptly halt their aimless wandering and begin laying the structure for tissue repair. Initially, the first phagocytic cells to arrive are neutrophils (short-lived) and these are followed by macrophages (long-lived). 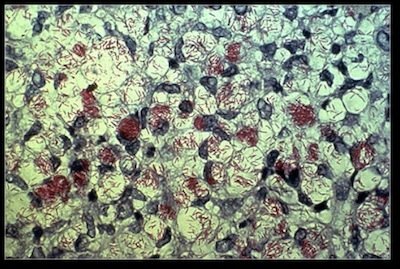 Phagocytosis has a limited control with cleaning and controlling leprosy. It takes three antibiotics to control it fully (Tortora, Funke, and Case 2013). Behe, Michael J. 1996. Darwin’s Black Box: The Biochemical Challenge to Evolution. New York: The Free Press. Brand, P. and P. Yancey. 1984. In His Image. Grand Rapids, Michigan: Zondervan Publishing Co. Brand, P. and P. Yancey. 1980. Fearfully and Wonderfully Made. Grand Rapids, Michigan: Zondervan Publishing Co. Francis, J. W. 2003. The organosubstrate of life: a creationist perspective of microbes and viruses, R. L. Ivey, ed.Proceedings of the Fifth International Conference on Creationism, pp. 434–444. Pittsburgh: Creation Science Fellowship. Gillen, A. L. 2007. Biblical Leprosy: Shedding Light on the Disease that Shuns. Answers Magazine 2, no. 3:77–79. Gillen, A. L., Sherwin, F. and A. C. Knowles. 2001. The Human Body: An Intelligent Design, 2nd ed. St. Joseph, Missouri: Creation Research Society Books. Gillen, A. L. 2009. Body by Design: Fearfully and Wonderfully Made, 6th printing. Green Forest, Arkansas: Master Books. Gillen, A. L. 2007. The Genesis of Germs: Disease and the Coming Plagues in a Fallen World. Green Forest, Arkansas: Master Books. Gillen, A. L. and F. Sherwin. 2005. The Immune System: Designed to Interact with Microbes. Origins 40:5–9, Biblical Creation Society. Gillen, A. L. and F. Sherwin. 2013. The Genesis of Malaria. Answers in Depth 8 (2013), Answers in Genesis. 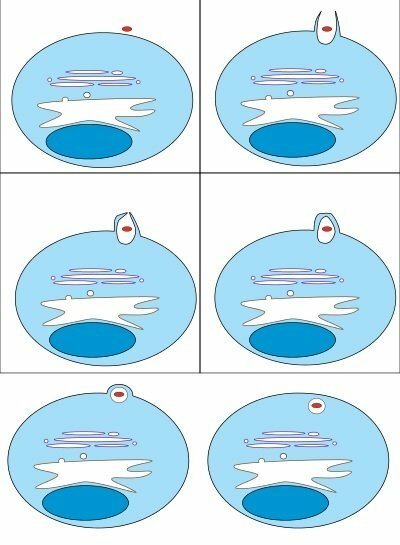 Phagocytosis. 2013. In Wikipedia. Retrieved July 3, 2013, from en.wikipedia.org/wiki/Phagocytosis. Rakoff-Nahoum, S., J. Paglino, F. Eslami-Varzaneh, S. Edberg, and J. Ruslan Medzhitov. 2004. Recognition of Commensal Microflora by Toll-Like Receptors Is Required for Intestinal Homeostasis. Cell 118, no. 2:229–241. Roberts, L. S., J. Janovy, Jr., and S. Nadler. 2013. Schmidt and Roberts’ Foundations of Parasitology, 9th ed. Boston, Massachusetts: WCB McGraw-Hill. Tortora, G. J., B. R. Funke, and C. L. Case. 2013. Microbiology, An Introduction, 11th ed. San Francisco, California: Pearson Benjamin/Cummings Pub. Co.